A blog about all things food. I know Christmas is over but some of you may still have a panettone or two lingering around. Panettone is a type of sweet bread/cake originating from Milan, usually prepared and enjoyed for Christmas and New Year in Italy and now in other countries as well. I had one here last week so I decided to spruce it up for our family night dessert. If you don't have any panettone left, make sure you save or print this recipe for next year. This recipe was inspired by my niece Daniela who made this same dessert for Christmas a couple of years ago. There are literally hundreds of variations you can experiment with from the type of panettone used, to what you use to brush the inner walls (Baileys or other alcohol adds a different flavour) and of course the ice cream you use to fill it. As you have gathered, this is a cheat version - you do not need to make the panettone or the ice cream. It's relatively quick and simple but definitely has a wow factor. I didn't fill mine quite enough and my photos aren't the best but you will get the general idea. 1. Leave tub of ice cream out of freezer so that it begins to soften. 2. Carefully cut the top of the panettone off and set aside. 3. Pull out the inside of the panettone, leaving enough of a wall and base so that it doesn't break. The panettone that you pull out can be set aside to be eaten at another time. 4. Using a pastry brush, lightly coat the inner walls and base of panettone with the espresso coffee. 5. Once the ice cream is sufficiently soft, fill the panettone with it. I should have put extra in because it wasn't completely softened and sunk a little once frozen. Make sure you pack it in! 6. Then simply place the top of the panettone back on, put the whole panettone in its original plastic package and seal tightly. 7. Put panettone into freezer for at least a couple of hours, or until ready to serve. 8. Then simply remove from packaging and slice up. So simple and yummy! Otto is an established favourite along the strip of restaurants on Cowper Wharf in Wooloomooloo, Sydney. A picturesque setting, combined with modern Italian cuisine and wine, provides the perfect escape from the drudgery of everyday life. I recently had the pleasure of dining there with friends and I must say their reputation for fine food has not waned. The hardest decision was always going to be what to order. When in doubt, have a little of everything! Degustation menus are a perfect way to sample more than one dish on the menu - so that's the option we went for. What follows is a pictorial tribute to our feast. Special thanks to our friends for helping with the food lighting...the dim lighting is the only drawback for a food blogger! We did the best we could under the circumstances. The photos don't do the food full justice. It was a delicious feast. The degustation menu is $140 per person (or $210 per person with matching wines). A little pricey for some, but well worth the treat! We added some fresh and dressed oysters to our menu and they went down a treat! Not sure this was on the degustation list either but it was included - delicately cut Prosciutto and Rockmelon. Tonno ‘Panzanella’Yellowfin tuna, tomatoes, cucumber, capsicum, croutons, olives, capers, basil. Carpaccio di Manzo Grainge Angus carpaccio, truffle dressing, aioli, capers, parmesan, baby rocket. Fiori di Zucchini Zucchini flowers filled with baccala, caponata. Tagliolini Black and white long pasta, QLD scallops, cherry tomatoes, chilli, garlic, basil. The next plate was a choice between fish and meat. I went with the Black Angus and was not disappointed. It melted in my mouth. Cappello del Prete Rangers Valley Black Angus flat iron beef MB 3+, celeriac, mushrooms, onion, pancetta, veal jus. Formaggio A taste of cheese with quince paste and date. Selezione di Dolci Selection of miniature desserts. In all my reviews I like to pick a stand out dish, and in this instance I would have to say it was the Black Angus - I had mine medium (the most they will cook it) and it was mouth wateringly good! It was followed closely by those front two miniature desserts, each featuring favourite flavours of mine - coconut and chocolate. The dessert plate was shared in pairs - a good thing, since by this stage we were pretty full. - and he certainly has done that. The ingredient quantities for this recipe are not set in stone. I tend to tinker with them, depending on what I have available. Plus I always like to add extra zucchini and flowers if I can! The quantities listed are enough for two large serves with leftovers. * Thermomix users can use tablespoon of homemade vegetable stock dissolved in 160ml of water. 1. Heat a little oil in a fry pan and fry the grated zucchini and flowers on medium heat until wilted and starting to brown. Stir mixture occasionally to avoid it burning and sticking to pan. 2. Add as little or as much chilli as you desire and mix through. 3. Then add pine nuts, lemon zest and stock and cook for another few minutes. Season with a little salt. 4. Meanwhile, cook spaghetti in boiling, salted water to your liking. Once cooked, drain and place back into saucepan. Toss some of the zucchini mixture through the pasta so that it's well coated. 5. Dish pasta into individual plates and top with some additional zucchini mixture, as well as a little Parmesan if desired. The best thing about these custard biscuits, besides their deliciousness, is how quick and easy they are to make. So quick you can whip them up in about 20 minutes for unexpected morning or afternoon tea guests! They are also a great biscuit for the kids to help make. 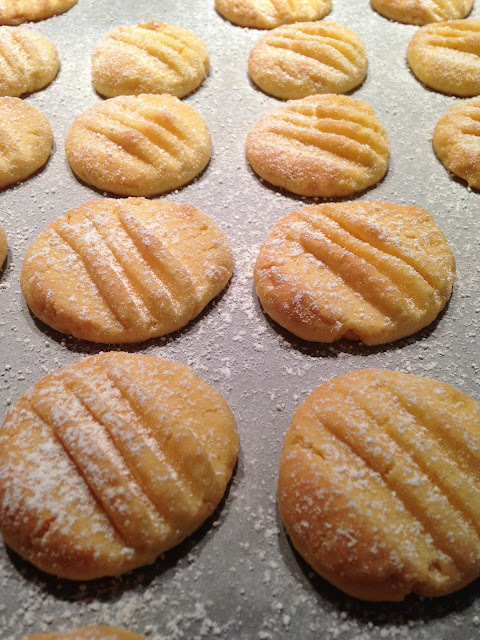 I use my Thermomix to make the batter but you certainly don't need one to make these biscuits. There are also many variations you can try. The recipe below is for the plain vanilla ones, however you can add about 40-50g of cocoa to make chocolate ones; or sprinkle with chopped nuts and other toppings as seen in picture at the bottom of this post for more variety. 1. Preheat oven to 180 degrees Celcius fan forced and line 2 baking trays with baking paper. If you don't have two trays, you can just bake alternative batches using same tray once it has cooled slightly. 2. Place butter, sugar and vanilla into Thermomix and mix for 20 seconds at speed 5. If using a food processor, process for a couple of minutes or until ingredients are well combined. 3. Add flour and custard powder into Thermomix bowl and knead for 30 seconds. If using a food processor, pulse until just combined. If you over mix, the biscuits may not have the soft texture that you are after. 4. Roll tablespoons of the mixture into balls and place on prepared trays. I use a measuring tablespoon to try and get them all roughly the same size. Then using a small fork dipped in a touch of flour (so as not to stick), slightly flatten each ball. This will give the biscuits a lovely ridged design. 5. Bake for 10-12 minutes or until slightly golden. Once removed from oven, leave them on tray to cool or wait 5-10 minutes and then transfer to a wire rack to cool completely. If you try to move them too soon after taking out of the oven, they will break. They harden a little as they cool. I don't know many people who don't like spinach dip. It always seems to be a winner at parties, and I've heard more than one person declare that they could just sit there and eat the entire bowl. I'm definitely in the fan category and so I have tried many different versions of this dip. This is my friend Geni's recipe and I can honestly say it is by far my favourite version of spinach dip! I see people devouring other spinach dips, and I think "you really need to try Geni's version!" This dip can be eaten cold but oh my goodness, when served warm, it is heavenly! So, without further ado, here is Geni's Spinach Dip! 1. Fry onions in a saucepan with the butter until soft and opaque. 2. Add spinach and stir until all broken up and mixed with onions and butter. 3. Sprinkle the packets of French Onion and Spring Vegetable soups over the spinach and stir to combine. 4. Pour in the sour cream and mix to combine. Bring to the boil and then let simmer for a minute or two. 5. In the meantime, cut off the top of the cob bread and pull out the centre crumb in the base, leaving a thick enough shell to serve your dip from. 6. Chop the top of the cob bread and the centre crumb part into bite size pieces and place around the base in an oven proof dish. 7. Pour the dip into the cob bread base and then place dish in a preheated oven (150-180 degrees Celsius) until bread and dip are slightly toasted or beginning to brown. These truffles are a rich, indulgent treat and perfect for Christmas gifts, although they do need to be kept refrigerated because of the cream cheese. I have been making these for a number of years and I upped the chocolate ante with this recipe by adding Nutella. They are always a winner with those who have a sweet tooth :) Even better, the recipe is super easy! There are a number of possible variations and I have listed some of these at the end of the page. The chocolate coated ones are particularly rich, so you may like to make smaller versions of this type. The quantity will obviously depend on the size of each truffle. If you are a chocoholic or just looking for a good hit of chocolate, this is the recipe for you! They are more chocolatey than cheesecake tasting, so if you are a fan of chocolate but not cheesecakes, still give them a try! 1. 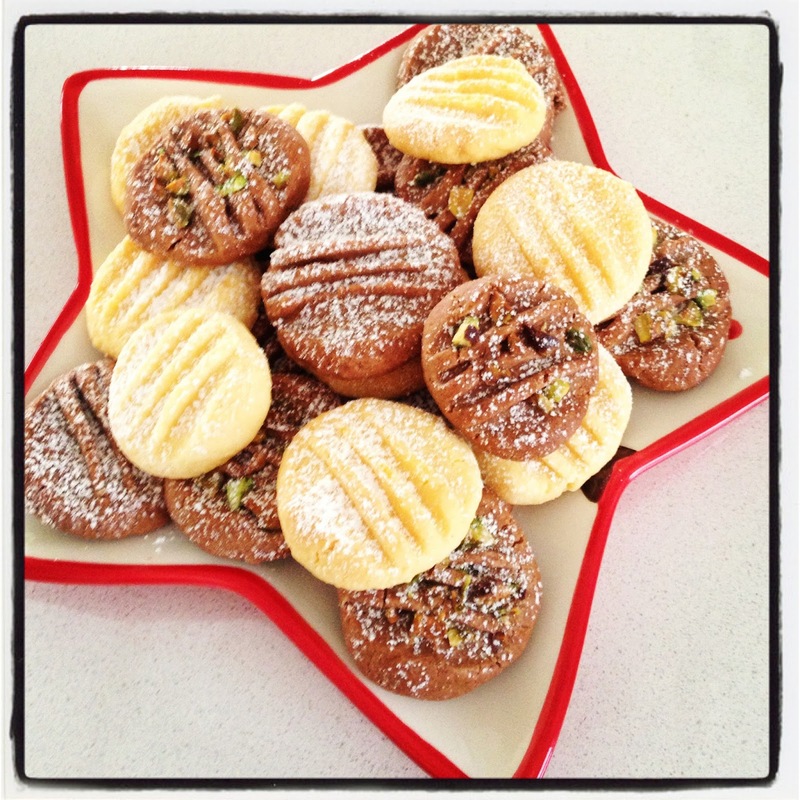 Place Choc Ripple biscuits in Thermomix and blitz for 10 seconds, speed 7. This will result in a crumb mixture. Biscuits can be crushed in a food processor or by rolling pin if you don't have a Thermomix. 2. Add cream cheese and mix for 20 seconds, speed 6. If using a food processor, mix until well combined. 3. Add Nutella and mix for a further 15 seconds, speed 5 or until well combined. 4. Roll mixture into balls and set out on a lined baking tray. Once completed, place tray in freezer for an hour or so until truffles become firm. The freezer part is more important if you are planning to coat with chocolate. If you are just going to use the coconut, half an hour in the fridge is plenty. 5. If coating with chocolate, melt your chocolate and then work as quickly as possible before it hardens. Picking up each truffle with a skewer, dip into melted chocolate and then place into a small truffle/cupcake case. Sprinkle with crushed nuts. 6. 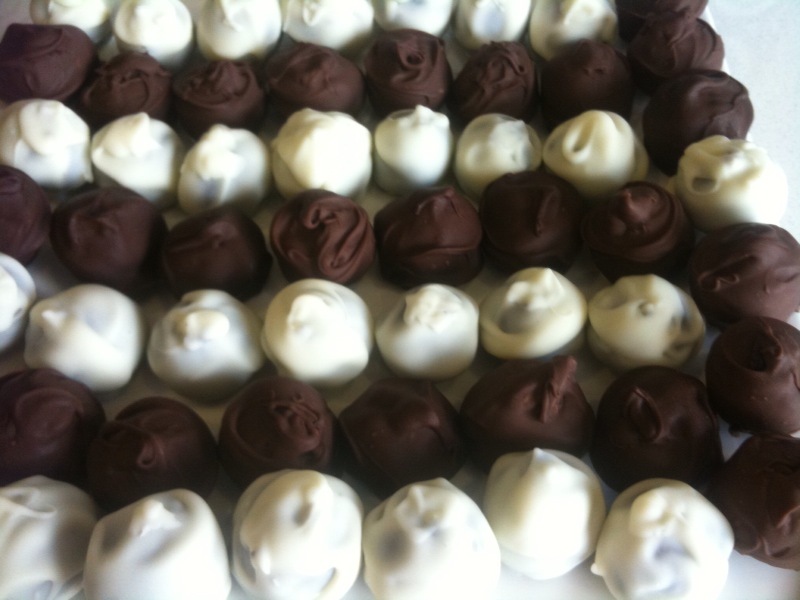 If coating with coconut, simply roll truffles in a plate of coconut and place in cases. See variations to recipe at end of page. * Nutella can be omitted for a slightly less rich truffle. * Choc Ripple biscuits can be substituted with Oreos. * White or milk chocolate can be used instead of dark. I've used all three before and sometimes it's nice to see the contrast of the filling with the white chocolate. * Anything can be used as a garnish. 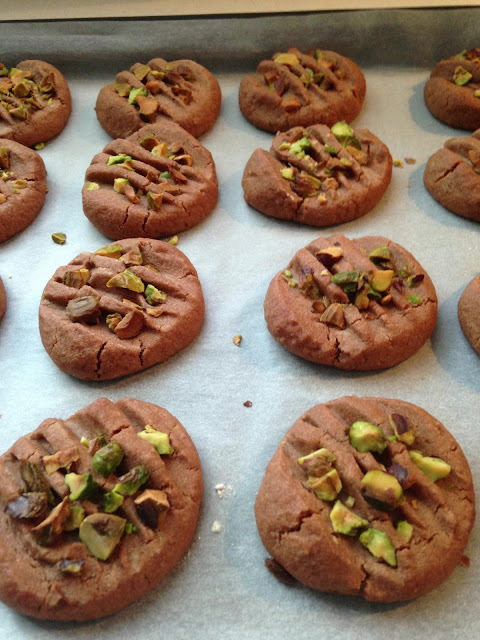 Here I used crushed macadamia and pistachio nuts. You can use a different type of nut, crushed candy or swirls of chocolate in contrasting colour to name a few. Chicken Cacciatore is an Italian dish that many of you have probably heard of or tasted. The word "cacciatore" means “hunter” and this dish originated in the Renaissance period when only the wealthy could afford to enjoy the sport of hunting and subsequent poultry that was caught. It's a dish that has many variations, and this is my Thermomix version. 1. Fill Thermomix bowl with approximately a litre of water. 2. Place rice in Thermomix basket and rinse for a few minutes under running water. Then place basket inside bowl. Cook for 20 minutes at 100 degrees/speed 4. 3. When rice is finished cooking, remove basket carefully and spoon rice into Thermo Server, fluffing with fork so as to separate grains. Set aside with lid on while you cook the chicken. 4. Place garlic and capsicum into Thermomix bowl and chop 3 seconds/speed 7. 5. Add 20g oil and sauté for 2 minutes at 90 degrees/speed 1. 6. Add chicken, crushed tomatoes, basil, parsley, stock, wine and carrots to the bowl and cook for 20 minutes on reverse at 100 degrees on soft speed (spoon symbol). 7. Place mushrooms into bowl and cook for 7 minutes on reverse at 100 degrees on soft speed. 8. Finally, add olives and cook for a final 1 minute on reverse at 100 degrees on soft speed. 9. Dish out rice on to individual plates and then spoon chicken cacciatore beside it or on top, however you prefer it.